Frequent urination can be a temporary problem or a chronic issue that varies in severity. Frequent urination can be accompanied by the urgent need to relieve yourself, which can be anxiety-provoking and embarrassing if you are not near a restroom. You may also experience pain when faced with an increase in urination associated with a condition called interstitial cystitis. Drinking too much soda could be a cause of your condition. Drinking too much of any beverage, including soda, could cause frequent urination. Your bladder stretches when full, but has its upper limits of how much the pouch can hold. When you drink more than your normal volume of liquids in a relatively short period of time, your bladder cannot handle the excess pressure. The result is frequent urination and in some cases, urinary incontinence. To remedy this cause of frequent urination, sip on your soda throughout the day instead of downing a can or bottle in one sitting. Stop drinking soft drinks a couple of hours before you go to bed to avoid nocturia, the frequent urination that occurs at night. You may experience frequent urination if the sodas you enjoy contain caffeine. Caffeine is a stimulant that can irritate the bladder. A bladder that becomes irritated signals you to empty it; you may experience frequent urges to void even if you do not urinate very much each time. Manage caffeine-induced frequent urination by switching to decaffeinated soft drinks, as well as caffeine-free teas and coffees. Avoid chocolate as well if caffeine irritates your bladder. The sweeteners in your diet soda could be the culprit for your urinary distress. Although the evidence is more anecdotal than scientific in nature, the Interstitial Cystitis Association explains that some people feel more pain and urinary frequency urges after consuming foods and beverages that contain artificial sweeteners. Registered dietician Julie Beyer reports that some people with interstitial cystitis can tolerate sucralose in small doses, while others are more symptomatic when using sugar as their sweetener of choice. Regular soda may contain more calories than the diet versions, but may help reduce your urination frequency when used in moderation. 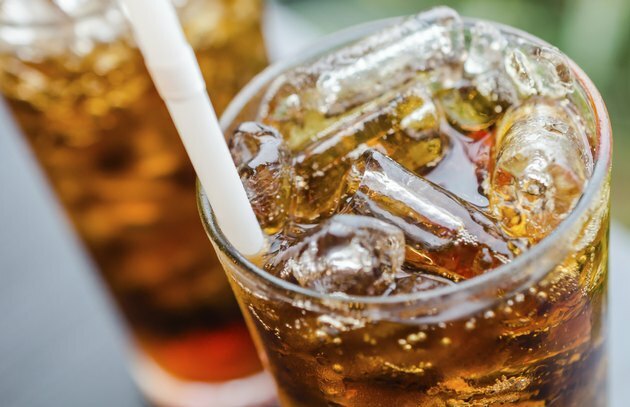 Drinking too much soda could be a major cause of your urinary issues not because of the caffeine or sweeteners, but due to the fact that the beverage is carbonated. Carbonation is a bladder irritant, and can make you urinate more often than you normally would when consuming the same volume of a non-carbonated drink. What Causes Bladder Irritation When I Drink Soda? Does Diet Soda Cause Frequent Urination? Can Soda Cause Bladder Infections?